Harison rose to a place of prominence, but is perhaps best known for his fight to keep Vermont as part of New York State. Richard Harison did not actively participate in the Revolutionary War. It is difficult to track down where Harison was during the war, but it seems that he remained in his hometown…British occupied New York City,. This means Harison at least feigned loyalty to the Crown. He may have been a full Loyalist, though this seems unlikely as he did not leave when the British evacuated New York and he went on to play an important role in that city’s early years. Most Loyalists had their property confiscated by the Patriots. By 1787, Richard Harison was invited to speak on the floor of the New York State Assembly. The topic of discussion was Vermont’s independence. For decades, Vermont had been claimed by both New York and New Hampshire. During the Revolution, Vermont declared independence from both the British and the Continental Congress. The New York Assembly was considering an agreement to acknowledge the separation. Harison was arguing against allowing Vermont to separate from New York. His opponent on this front was Alexander Hamilton (a friend with whom Richard had frequently partnered in the courtroom). Richard’s main argument was that New Yorkers who owned property in the Vermont would lose their investments. This was a concern shared by many in the State. The Assembly decided in favor of Hamilton and approved Vermont’s independence. The State Senate, however, agreed with Harison and overturned the decision. It would be another four years (during the Presidency of George Washington) before Vermont was granted Statehood. When that happened, Harison’s fears were alleviated as provisions were allotted to reimburse property owners for their losses. In the meantime, Harison had been elected to the State Assembly. Furthermore, he attended the New York Ratification Convention, where he championed and voted for the United States Constitution. Soon thereafter, Richard was appointed as the inaugural United States Attorney for the District of New York. In this position, he prosecuted some of the earliest cases brought on by the National Government. Richard held this office for over a decade. Additionally, Harison would go on to obtain the job of Recorder of New York City. The office sat him on the city’s Board of Supervisors. It also left him as one of the highest ranking Judges in Manhattan. Do you want to read about other people involved with the Founding of Vermont? Enjoy these articles on Ethan Allen, his brother Ira Allen, and Constitution Signer William Samuel Johnson. Want to learn more about the Founding of Vermont? 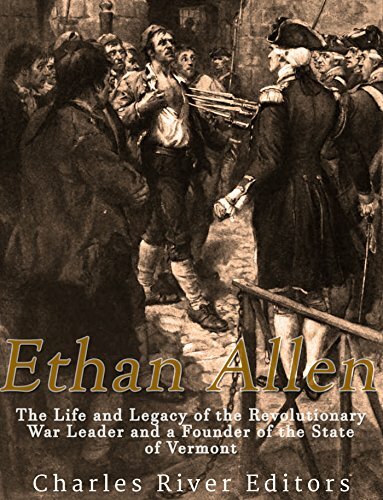 The best recommendation I have to to read a biography of Ethan Allen, who was there for all of the important turning points. I really enjoyed ‘The Life and Legacy’ and I think you might too.. Pick up a copy through the Amazon affiliate link below (you’ll support this site, but don’t worry, Amazon pays me while your price stays the same).